For over 17 years now, Great Lakes Seamless Gutters & Quality Roofing has been able to offer you the best products available for rates 20-40% lower than our competitors! Instead of buying costly prefab products, we custom-make our own onsite with portable roll forming machines.This has made us a very strong competitor in the industry, and we quickly became the #1 choice for all gutter & roofing needs! 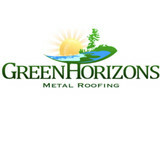 We are manufacturers & installers of Metal/Shingle/Rubber/PVC roofing. Specializing in "Seamless" Metal Roofing Systems, Seamless Gutters, Gutter Covers, Downspouts & Access. No Seams or Screws Exposed! All products are available in Alum/ Copper or Steel, w/ over 30 Colors to choose from. Lifetime Warranty. Licensed & Insured. Our business is our livelihood but it is also so much more. 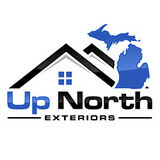 Up North Exteriors was started to fill in a void in the current market and to make a business that people can place their trust in. Over the years we have never lost our commitment to our clients and that is what has allowed us to succeed in a very competitive industry. The employees of Up North Exteriors stand committed to our purpose and will provide the best service! As a full-service gutter installation company, we install aluminum and copper seamless gutters that are custom made on-site to perfectly fit a home’s exact dimensions. Our gutters are designed to eliminate the seams and splices that are characteristic of traditional gutters to create a beautiful, smooth look to a home’s exterior. Rainbow Seamless attaches gutters with SnapLock, an innovative, free-floating gutter installation system that creates a water-tight seal between the gutters and the roofline. This installation method is superior to traditional spike-and-nail attachments because seamless gutters are fastened to a house without being punctured, reducing the risk of damage to gutters and homes by water seepage, rust, rot, and mold. 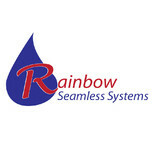 Rainbow Seamless Systems also offers and installs a variety of optional features for gutter systems that can enhance their performance and longevity. For example, our Gutter Helmet ® gutter covers will keep gutters running free and clear by preventing debris like leaves and branches from clogging the drainage system, helping ensure you’ll never clean your gutters again®. The patented nose-forward design of the Gutter Helmet ® gutter guard system uses the natural forces of gravity and surface tension to pull rainwater directly into the gutters through a precise, 3/8” slit while debris falls away. This system can handle up to 21 inches of rainwater per hour – a virtually unprecedented amount of rain – and move more water away from the home to prevent flooding, foundation damage, and erosion. We can also install a gutter heating cable in the Gutter Helmet ® system and along the roof that can help prevent the formation of ice dams in the winter, which can cause costly water damage to homes. The heating cable can be easily controlled from the comfort of the home using a simple switch in the garage or by the breaker box. In addition to gutters, gutter guards, and heated gutter cables, Rainbow Seamless Systems also offers and installs under deck systems, spray in insulation, and retractable awning products. 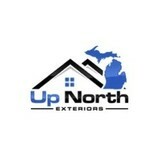 Up North Exteriors is a Traverse City Residential Roofing company. We take an innovative approach in today's Roofing. We provide top quality material as well as advanced roof installation. Our goal is to create optimal performance while maintaining high efficiency in bringing the best roofing solutions to our customers. Qualified Roofing proudly serves as a locally, family owner and operated, full service roofing company. Joel Beckham and Jon Majszak have been serving the Grand traverse community for over 20 years. Joel first started roofing in this area 20+ years ago, working for wonderful mentors and role models such as the late Ron Story, the prior owner operator of Story Roofing, Rodney Mills of Mills Construction. To this day if you were to ask nearly any local person involved in the roofing industry they will know of and affirm the Quality and ethics of Joel Beckham. Thus the name "Qualified Roofing". Our goal is to do more than just create clients. We strive to create long term relationships. We try to look at every job from the perspective "What would we want if it was our own job, or that of a friend or family member". This holds true to a key foundation statement passed down from a mentor and fellow carpenter. "Do to others as we would have done for ourselves". If there is one thing that we care about, it's our customers. We strive for customer satisfaction in every process of our business. Michigan Gutters, Inc, offers a wide selection of materials and information for the best job at the best price. Our materials are the highest quality available and are installed by experienced and well-trained experts. Michigan Gutters, Inc, is one of the fastest growing gutter companies in Northern Michigan. This is only possible by taking extreme pride in our work and taking care of our customers like they are part of our own family. If you are looking for the highest quality work at the best prices, we are the company for you! Request a free consultation today. Specializing in residential and commercial roofing. We offer new construction projects, re-roofing on existing homes, and repairs. We install composition shingles and rubber membrane for flat roof applications. We are certified applicators of CertainTeed roofing products. The rubber membrane products we use are also manufactured by the CertainTeed Corporation. We also now install color clad seamless gutters. These are available in 42 colors. All gutters are custom fabricated on your site. 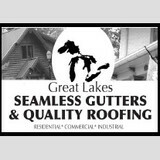 Anchor Seamless Gutters is a subsidiary of Lee Roofing Inc., and also operates out of our offices in Harbor Springs. Mariage Roofing is a fully licensed and insured roofing contractor that has been serving the Traverse City area, as well as Antrim, Kalkaska, Leelanau and Benzie counties since 1971. We are dedicated to employee training and providing our customers with a professional roofing experience from first contact to completion. Traverse City roofer, Grand Traverse Roofing is a reputable leader in the Traverse City roofing industry. Grand Traverse Roofing acts as a leading provider of roofing services in the Traverse City area including the following services: steep asphalt, standard shingles, slate, cedar shake, metal shingles, low slope roofing, flat roofing, EPDM and standing seam metal. No Traverse City roofing job is too big or too small for Grand Traverse Roofing. As Mother Nature continues to wreak havoc on the ecosystem, it is imperative that your home has the most durable and reliable structure and engineering to protect it from wind, rain, and snow. What do roofing companies in Petoskey, MI do? Your Petoskey, MI roofing contractor can install a new roof or repair an old one, as well as repair and replace gutters. Good roofers in Petoskey, MI should be able to promptly inspect roofs and gutters to assess damage after a natural disaster or other event, and give you an estimate for the necessary roof repair immediately. Some Petoskey roofing companies specialize in specific types of roofs, such as tile or metal, so make sure the one you are interested in works with the materials you have or desire. Find a Petoskey roofer on Houzz. Narrow your search in the Professionals section of the website to roofing companies in Petoskey, MI. If you’re planning a large-scale project, find other professionals on Houzz who can help get the job done. Here are some related professionals and vendors to complement the work of roofing & gutters: General Contractors, Specialty Contractors, Siding & Exteriors, Door Sales & Installation, Garage Door Sales & Installation.